A multi-sectoral alliance for the protection of marine ecosystems is pushing Manila Mayor Alfredo Lim to revoke the city ordinance lifting the ban on reclamation in Manila Bay and allowing Manila Goldcoast Development Corporation to reclaim a portion of the bay for commercial and business purposes. The newly-formed People’s Network for the Integrity of Coastal Habitats and Ecosystems (Peoples’ NICHE) calls for the restoration, instead of reclamation, of the coastal waters of Manila Bay, amid talks of plans by the local government to open the site for the construction of “Solar City,” a commercial complex for entertainment and tourism. Community leaders and conveners of the People’s NICHE called for restoring Manila Bay instead of reclaiming the bay during launching of the People’s NICHE today at the RJMC Bldg, Malate Church. “Further reclamation of Manila Bay will greatly endanger the fragile marine ecosystem which contributes to food production and mitigates the disastrous effects of calamities and floods in nearby areas. The bay also has historical and cultural value that must be preserved for future generations,” said People’s NICHE spokesperson Dr. Jojo Carabeo. “What the national and Manila City government should focus is to restore the previous pristine environment of Manila Bay and surrounding communities. Until now, the government has not implemented the comprehensive clean up of the bay as ordered by the Supreme Court (SC) for the Department of Environment and Natural Resources and 10 other government agencies,” Dr. Carabeo explained. The SC on February 15, 2011 rendered a decision based on recommendations by the Manila Bay Advisory Committee (MBAC) to set time frames for the agencies to perform the clean up ordered in a “writ of continuing mandamus”. The mandamus was issued in December 2008 as a result of a complaint filed by “concerned residents of Manila Bay” on the alleged inaction of government to improve the bay’s condition. “The country’s annual fish catch is on a steady decline largely attributable to severe degradation of coastal and marine habitats with up to 98 percent of our coral reefs currently at risk at present, 75.6 percent of mangroves lost in the past 82 years, and 50 percent of seagrass beds lost in the past 50 years,” read the People’s NICHE unity statement. 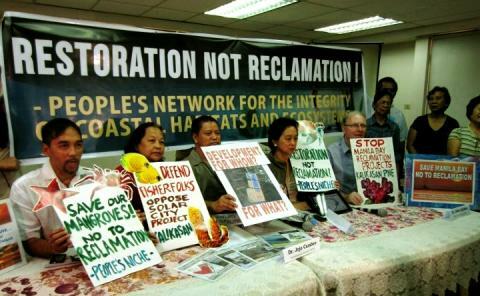 The broad network has earlier called for the national government to impose a 10-year moratorium on all reclamation projects in the country, a sanction endorsed by 75 organizations that convened in the first ever People’s Summit on the Impacts of Reclamation held last year. “The history of reclamation projects is riddled with corruption and the lack of social acceptability like what we experienced in the controversial PEA-Amari deal and the anomalous Diosdado Macapagal Highway project. Also, thousands of families in Metro Manila were displaced by reclamation projects,” said Kalikasan PNE National Coordinator Clemente Bautista, Jr.
“Reclamation is an aberration under existing legal framework for ecological sustainability and the climate challenges that we face. The Local Government Code likewise requires a national law and a plebiscite in the event of substantial alteration of the territorial boundaries of local government units,” added Atty. Gloria Ramos of the Philippine Earth Justice Center. Categories: Media, Uncategorized | Permalink.